Often we use cumin as spice. Similarly there is a black cumin which has black color and health properties. This natural medicine not only enhances the flavor of food but also it is quite powerful medicine. The old people use it to fix minor ailments. In Islam, black cumin has prompted to overcome every kind of disease except the death. In the Bible, it is mentioned as miraculous. Black cumin oil is used in many diseases. Let us know its health properties. Caution: Never use whole black cumin. It should be warm before using it. Do not eat more than 25 grams. Pregnant women should not use its oil. If its seeds will be taken in large amounts then it can cause abortion. It is better to consult doctor before you intake it. Stomach Problem: You can get benefit by taking a teaspoon black cumin after eating heavy meal. It relieves constipation and makes digestion comfortable. It kills intestinal worms. Increase Immunity: It increases the body’s immunity. It removes fatigue, weakness and produces energy in the body. It makes bone marrow stronger so body becomes strong. It must have eaten wit garlic. Skin Problems: Cumin oil can be used in skin’s common problems such as cirrhosis, acne, allergies, wounds, rashes and irritation. Increase Breast Milk: Women who do breast feeding they should consumed black cumin as it increase the production of milk. Beneficial in cough and asthma: To get rid from cough you can chew black cumin. Use black cumin in hot soup. You can eat black cumin powder with honey. Boil black cumin in water and take steam to get comfort. You can apply black cumin oil on the chest and back. 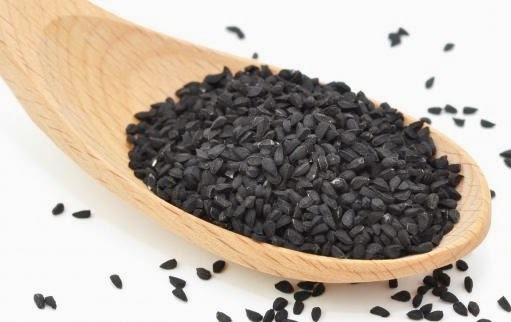 Beauty Cosmetic: Black cumin helps to make long and shiny hair and firm nails. Some people use black cumin’s tablets and some apply oil on the body parts. Headache: Apply black cumin oil on head and stomach. You get rid of the pain of migraine. Toothache: Mix hot water and black cumin oil. Then do gargle. It will help you a lot.